We recommend checking out our discussion threads on the Moultrie M-880 Game Camera (Gen 2) MCG-12691, which address similar problems with connecting and setting up Trail/Wildlife Cameras Moultrie. The user manual for the Moultrie M-880 Game Camera (Gen 2) MCG-12691 provides necessary instructions for the proper use of the product Optics - Firearm & Field Accessories - Trail/Wildlife Cameras. 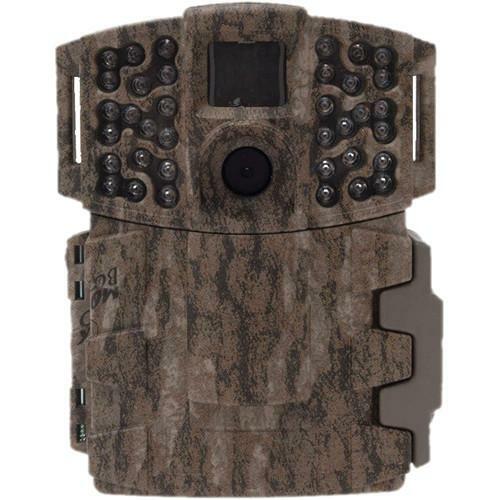 Mossy Oak Bottomland camouflages the second generation Moultrie M-880 Game Camera from the prying eyes of the animals you are trying to pattern. With a top resolution of 8MP, this camera is activated by either a passive infrared sensor or can be set in time lapse modes to best capture animal activity. A trigger speed of 1.0 second allows you to capture an animal no matter if it is traveling briskly. A 36-LED flash with 100' range provides illumination for a clear shot at night. A passive infrared sensor detects animals by movement or by sensing their body temperature as they cross the invisible beam. You can choose between high sensitivity which is well-suited for settings such as open fields, or low which helps minimize false triggers in wooded scenarios. You can easily aim this unit using the built-in IR Aim mode. When activated a red LED on the camera's face illuminates once the beam is crossed, letting you know exactly where the unit is pointing. You can choose between single shots or burst mode which takes 3 pictures every time the unit is triggered. The shots can all take place within 1 second or can be delayed up to 1 second between shots. Shooting with the momentary delay can help determine an animal's direction of travel. Beforehand, you can turn on Infostrip data stamping which features camera name, time, and temperature in Fahrenheit or Celsius for each shot. In addition to the infrared trigger, you can set the camera up to take pictures at a preset interval. You can choose between a range of different interval settings, lasting from as little as 10 seconds to as long as 24 hours. You can disable the infrared trigger or allow it to continue to take pictures every time the beam is crossed. This camera captures video in 16:9 aspect ratio and offers two video resolutions which allows you to choose between higher quality video or smaller file sizes to preserve space on your memory card. You can select film clips of 5, 10, 30, 60, or 90 seconds in VGA 640 x 480 or HD 1280 x 720. The M-1100i accepts SD memory cards up to 32GB, which are available separately . It runs on 8 AA batteries, which are also not included. This camera's engineering features an external power port for the optional PowerPanel solar panel, AC Adapter or Battery Box for longer run times out in the field. A 1" wide by 6' long olive drab strap is included for mounting to trees. In addition to the strap, the camera's case has a 1/4"-20 mount on the bottom so you can use it on a tripod when trees aren't present. It is water/weather-resistant to ensure durability over extended periods of outdoor use. The side of case also features a Python lock-compatible hasp for additional security. If you own a Moultrie trail/wildlife cameras and have a user manual in electronic form, you can upload it to this website using the link on the right side of the screen. Box Dimensions (LxWxH) 9.9 x 6.1 x 3.7"
The user manual for the Moultrie M-880 Game Camera (Gen 2) MCG-12691 can be downloaded in .pdf format if it did not come with your new trail/wildlife cameras, although the seller is required to supply one. It is also quite common that customers throw out the user manual with the box, or put the CD away somewhere and then can’t find it. That’s why we and other Moultrie users keep a unique electronic library for Moultrie trail/wildlife camerass, where you can use our link to download the user manual for the Moultrie M-880 Game Camera (Gen 2) MCG-12691. The user manual lists all of the functions of the Moultrie M-880 Game Camera (Gen 2) MCG-12691, all the basic and advanced features and tells you how to use the trail/wildlife cameras. The manual also provides troubleshooting for common problems. Even greater detail is provided by the service manual, which is not typically shipped with the product, but which can often be downloaded from Moultrie service. If you want to help expand our database, you can upload a link to this website to download a user manual or service manual, ideally in .pdf format. These pages are created by you – users of the Moultrie M-880 Game Camera (Gen 2) MCG-12691. User manuals are also available on the Moultrie website under Optics - Firearm & Field Accessories - Trail/Wildlife Cameras. I ordered from amazon but have misplaced instruction booklet. It has stop taking pics. Please send the off manual so we can download it.